New 2019 Ford Ranger's Frame vs. Toyota Tacoma's Frame - How Do They Compare? The frame of the Toyota Tacoma has long been a sore spot among owners and fans. Here's how the new 2019 Ford Ranger's compares. Go to any new vehicle release and all automakers can tell you is how much stiffer the vehicle is compared to the outgoing model. Stiffness is in, and in a truck, stiffness starts with a stiff frame. Unlike unit body constructed vehicles (Honda's Ridgeline for example), most trucks use a body-on-frame design. The suspension hangs from and is attached to the frame as is the engine and transmission and the cabin and the box are hung on the frame from the top. Truck folks generally want a "Fully-boxed frame." The Toyota Tacoma does not have one. Rather the Tacoma has a fully boxed frame up front. Under the passenger space it is a double C-channel frame (open, not boxed) and under the bed it is a single C-channel. 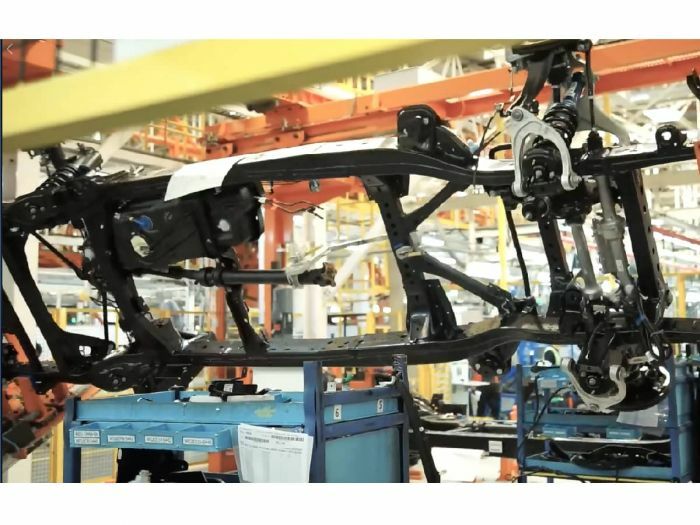 When we attended the press release of the new-generation Tacoma a few years ago, one of my colleagues asked if the Tacoma frame was fully boxed. The Toyota representative explained that the C-channel had benefits. He said something to the effect of "It allows the truck to flex when off-roading." Nobody in attendance from the press was happy with that statement. The Colorado and Canyon use a fully boxed frame. That got us wondering if Ford would use a fully boxed frame as well. We looked closely at the manufacturing images from the Asia-Pacific market to get some insight. You can see the image we grabbed off of a Ford video from that market. It looks fully-boxed to us. Ford says it is made from high-strength steel. That will mean stiffer and lighter than mild steel. Let's hope that Ford also uses proper anti-corrosion treatments as well. Toyota's frame rot problems have become legendary.